2016 marked the year of the special 90th Birthday of Her Majesty Queen Elizabeth II. To commemorate this occasion, a stunning solid bronze, medal has been struck. 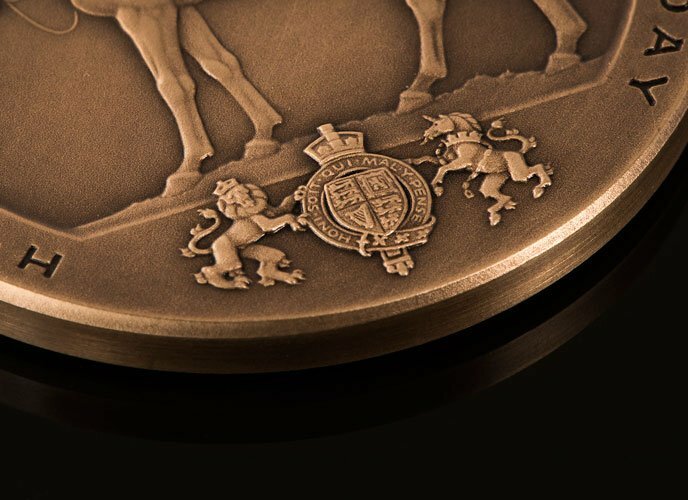 Each medal measures an impressive 61mm in diameter allowing each and every detail of sculptor Philip Nathan’s intricate design to be realised. 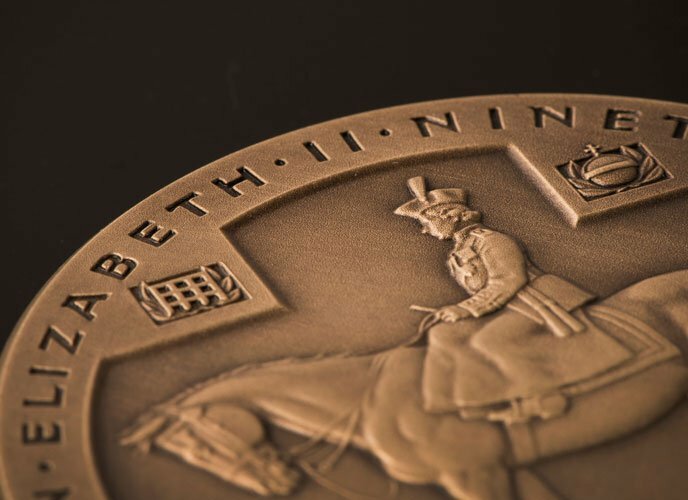 The majestic design of the medal has been approved by Buckingham Palace and is the work of the renowned sculptor, coin and medal designer Philip Nathan, who has been at heart of British coin design for over 40 years. 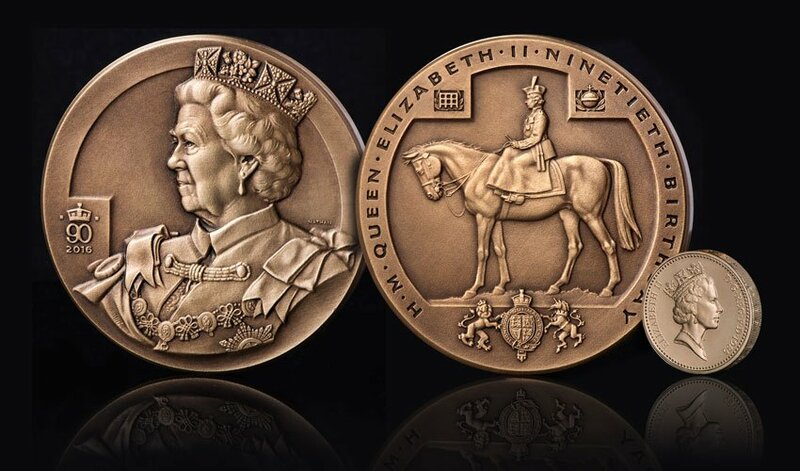 Nathan’s portfolio includes the 1977 Silver Jubilee Crown and the 1981 Prince Charles and Princess Diana wedding coin, while in 1987 he won a competition to create the new Britannia gold bullion coin for the Royal Mint ahead of 14 other designers and 52 designs. He also co-founded the Society of Numismatic Artists and Designers with the late Christopher Ironside, designer of most of our decimal coinage. 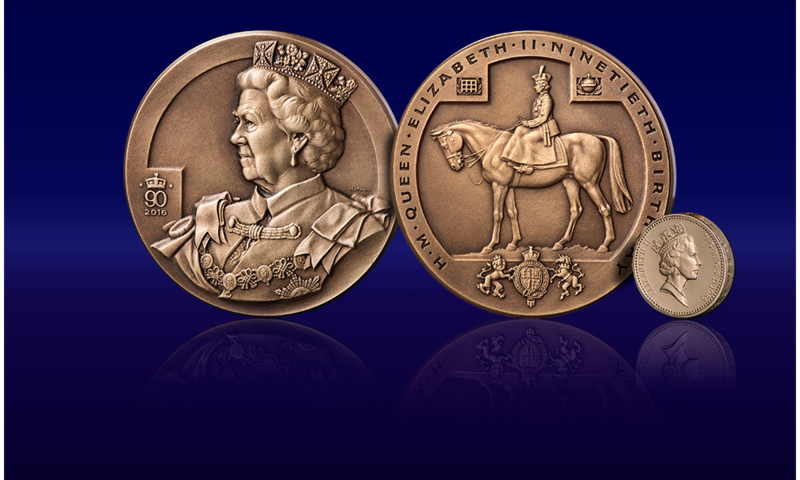 He has created the Charity Medal exclusively for the royal birthday celebrations, so its design will not be replicated elsewhere. The obverse features a head and shoulders portrait of the Queen wearing the cloak of the Order of the Garter and the famous Royal Diamond Diadem. 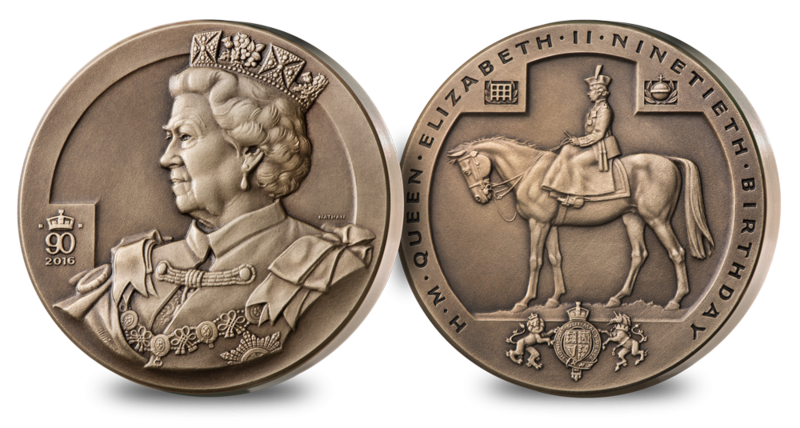 The beauty of the design for the reverse of the Charity Medal is that it echoes the famous equestrian portrait of the Queen that was used on the 1953 Coronation Crown when she was depicted at the Trooping of the Colour ceremony in the uniform of Colonel-in-Chief of the Grenadier Guards and mounted on her horse, Winston.